As I write this (2009), the UK has gone Henry VIII crazy due to it being the 500th anniversary of Henry VIII’s accession to the throne. This anniversary means that there is a wealth of Henry VIII resources out there for us to enjoy and explore. As Anne Boleyn fans, we can’t ignore Henry VIII as he was a huge part of Anne Boleyn’s life and obviously the cause of Anne’s untimely death. 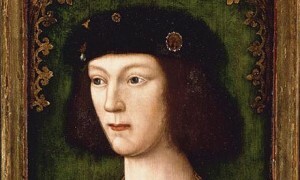 We need to explore Henry – his reign, his character, his background, his policies, Tudor times etc. – to get a good understanding of what drove the man and what his relationship with Anne was like. The British Library are running an exhibition, Henry VIII: Man and Monarch, to celebrate the 500 year anniversary, and as part of this exhibition they have released some podcasts. Here are the ones that are available at present, but they are adding to them all the time so keep checking – click here to go to the British Library Henry VIII podcast page. You can also find them on iTunes under “British Library Podcasts”. Anne Boleyn’s Book of Hours – Two of Anne Boleyn’s Books of Hours are on display at Hever Castle, but this third one is at the British Library. The great thing about this one is that it has messages from Henry to Anne and from Anne to Henry in it. Learn more from curator, Scott McKendrick, by listening to this podcast. Hilary Mantel: Wolf Hall – Author Hilary Mantel reads from and discusses her new novel, Wolf Hall, which is set during the reign of Henry VIII and centres around the character of Thomas Cromwell. Interested in this book? See Amazon.com or Amazon.co.uk . Henry’s Psalter – A podcast about Henry VIII’s own personal psalter, a book of psalms which he used for his personal and private devotions. James Carley, from York University, Toronto, talks about this richly illustrated book which depicts Henry as he wanted to be seen – as a modern day King David who slayed Goliath (the Papacy in this case!). The book also contains notes written by Henry and gives us an insight into his thoughts. David Starkey: The Young Henry 1491-1509 – This is a recording of a lecture that David Starkey gave on 12th May which deals with Henry VIII’s upbringing as a second son and not as a future king, his education, the people who shaped him, his induction into chivalry, his relationship with his father and his accession to the throne. David Starkey: The Change 1509-1533 – This second lecture (recorded on 2nd June 2009) looks at the personality change in Henry VIII: from the virtuous prince at the time of his accession, with his high ideals of virtue, glory and immortality, to the tyrannical streak he showed in maturity. Starkey blames the crisis of his divorce from Catherine of Aragon, which divided his family and destroyed his closest friendships. The Field of the Cloth of Gold – Brett Dolman of Historic Royal Palaces (the charity that owns Hampton Court Palace and the Tower of London) talks about this famous and elaborate meeting between Henry VIII and Francis I of France in 1520, in a field near Calais. Henry’s Music – Nicholas Bell and David Skinner discuss and listen to music written for and written by Henry VIII. This MP3 recording includes the full version of the Rose Canon, a composition which was given to Henry and Catherine of Aragon. Henry’s Maps – Henry VIII was a pioneer of modern cartography and in this audio, Peter Barber, a Tudor maps expert, looks at how Henry changed maps and the influence this had on England. This is a special blog created by the British Library for their Henry VIII: Man and Monarch exhibition – click here to read it. Birth, Accession, Death – On this page, you can explore the Beaufort Book of Hours, Sir Thomas More’s account of the coronation of Henry VIII, Edward VI’s diary, Sir Thomas Wriothesley’s account of Henry VII’s death, a document on Henry VIII’s coronation with notes by Henry himself, and a inventory of Henry VIII’s assets on his death. The Great Matter – Here you can see documents relating to Henry VIII’s struggle to divorce his first wife, Catherine of Aragon, and to marry Anne Boleyn. Documents include a letter from Henry VIII to Wolsey, a book of Sir Thomas Wyatt, collectanea satis copiosa (the Sufficiently Abundant Collections – documents from monasteries), Anne Boleyn’s Book of Hours, ‘Tabula librorum de histories antiquitatum’ (a list of 100 books in religious houses in Lincolnshire which pertained to Henry’s “Great Matter”) and the last letter of Sir Thomas More to Henry VIII. Musician, sportsman, worshipper – Key documents in this section include Henry VIII’s composition “Pastime with Good Company”, the Double Canon dedicated to Henry VIII, Henry VIII’s Psalter, joutsing rules for a 1511 jousting tournament, the Bishop of Worcester’s writing on purgatory with notes added by Henry VIII, and the Great Bible, which was thought to be the King’s own copy. Militarist and mapmaker -Key documents which relate to Henry VIII’s mapping skills, his navy and his fort building. Documents include a tent design for the Field of the Cloth of Gold, coastal defence maps, a design for a castle on the coast of Kent and the Anthony Roll (an illuminated manuscript with details on Henry VIII’s navy. David Starkey Videos – In these videos, Dr David Starkey, the famous Tudor historian, looks at key documents pertaining to Henry VIII’s reign. Clips are taken from the series Henry VIII: Mind of a Tyrant which is available in the UK and Europe. Henry VIII: Man and Monarch – This is the book which accompanies the British Library’s exhibition on Henry VIII and includes contributions by Tudor scholars like David Starkey, Eric Ives, James Carley, Diarmaid McCulloch, John Guy and Eamon Duffy. click here to buy in the US and click here to buy in the UK and Europe . Virtual Books – On this page of the British Library website, you can choose to “leaf” through Henry VIII’s Psalter. 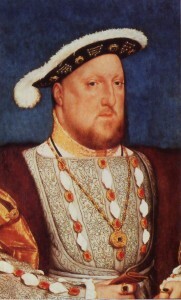 Interactive: Find Henry’s Margin Notes – This page –http://www.bl.uk/onlinegallery/onlineex/henryviii/interactive/index.html allows you to explore three key documents from Henry’s reign, zoom in on them, look at Henry’s notes and then click on the transcript to find out what Henry had written – fascinating! The National Archives in Kew, London, are home to many original documents relating to Henry VIII’s reign. click here to go to their special Henry VIII 500 year anniversary page which is split into “Power”, “Passion” and “Parchment”. You can see some documents and records online and order copies of them. Copies of the Baga de Secretis, the records relating to the arrest and trials of Anne Boleyn and the five men accused of sleeping with her, can be ordered from the National Archives – click here to request copies. On the St George’s Chapel website, you can now enjoy a 360º virtual tour of the chapel and see the final resting place of Henry VIII and Jane Seymour – click here to “tour” the chapel and see the Quire, the Nave and the Lower Ward. The ledger stone marking the burial site of Henry VIII, Jane Seymour and Charles I is found in the centre of the Quire. 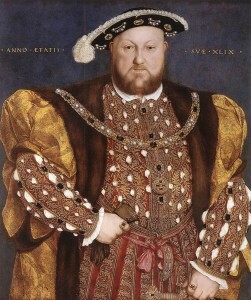 There are some great Henry VIII biographies, history books, fictional novels, films and documentaries available. Click here to explore our US Henry VIII resources or click here to explore our Amazon UK store. http://www.royalmint.com/store/BritishBase/UKH8BU.aspx – This is the page for the 2009 Henry VIII £5 Coin Pack which costs £9.99 and which includes a special £5 coin featuring a portrait of Henry VIII and a folder of information about Henry VIII which is richly illustrated. There is also an Elizabeth I and Henry VIII Coin and Stamp Cover set available at £24.99 (includes 2 crowns and 2 special stamps in a presentation folder), a 2009 UK Henry VIII £5 Platinum Piefort at £4,400, a 2009 UK Henry VIII £5 Gold Proof at £1,195 and a 2009 UK Henry VIII £5 Silver Proof at £44.95. The Historic Royal Palaces charity, which runs the Tower of London and Hampton Court Palace, are hosting lots of events to celebrate the 500th anniversary of Henry’s accession to the throne. You can find out about these events and also opening times, ticket prices etc. at their website and you can become a fan on Facebook and see photo albums of attractions like the gardens. See the Visit London Henry VIII page for information on all of the Henry VIII events going on in and around London. Yes, 2009 was a great year for those interested in Henry VIII.